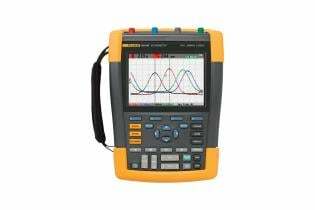 The Fluke ScopeMeter 190-204/S combine the highest safety ratings and rugged portability with the high performance of a bench oscilloscope. Designed for plant maintenance engineers and technicians, these tough ScopeMeter test tools go into harsh, dirty, and hazardous industrial conditions to test everything from micro-electronics to power electronics applications. The Fluke ScopeMeter 190-204/S portable scope is double-insulated four-channel floating oscilloscopes safety rated for measurements in CAT III 1000V/CAT IV 600V environments. Standard probes that cover a wide application range from mV to kV prepare you for anything from micro-electronics to heavy duty medium voltage electrical applications. Independent isolated inputs eliminate the risk of accidental ground short circuits by allowing you to make measurements in mixed circuits with separate ground references. Rugged and shock-proof, all ScopeMeter portable oscilloscopes are built for harsh environments. Their sealed cases protect them from dust, water vapor, drips, humidity and airborne pollutants ensuring reliable accurate performance every time you need them. 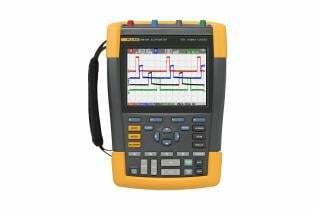 Built-in digital multimeter Fluke 190-204/S 4-channel models incorporate quad meter measurements via the 4-channel scope BNC inputs. 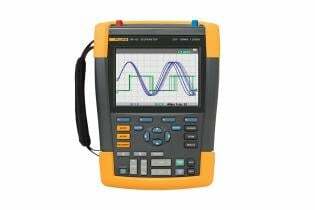 Conveniently switch from waveform analysis to precise multimeter measurements using the built in 5000 count digital multimeter. Measurement functions include VDC, VAC, VAC + DC, resistance, continuity and diode test. Measure current and temperature using suitable shunt, probe or adapter with wide range of scaling factors. New high-performance batteries take advantage of Li-ion technology to keep you going strong for up to seven hours. And with the easy-access battery door you can make battery swaps fast. Two USB ports, electrically isolated from measurement input circuits offer you easy USB connectivity to a PC or USB memory devices. Store unlimited waveform, screen captures or instrument steups to a USB memory device. Connect to a PC USB interface to transfer and archive critical measurement data using FlukeView software for windows. Connect-and-View™ automatically sets up correct triggering by recognizing signal patterns. Without touching a button, you get a stable, reliable, and repeatable display of virtually any signal including motor drive and control signals. Expedites measuring several test-points in rapid succession. As the first four-channel portable scope safety rated CAT III 1000V / CAT IV 600V, the Fluke ScopeMeter 190-204/S combines an unprecedented level of performance, ruggedness, and portability with 200 MHz bandwidth and real-time sampling rates up to 2.5 GS/s and 200 ps resolution to capture noise and other disturbances. 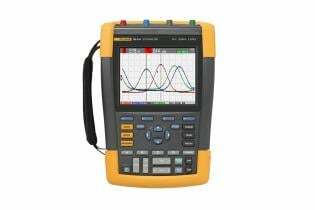 This model features deep memory up to 10,000 samples per channel; so you can examine very small parts of the waveform in detail, and it is IP-51 rated to withstand dust, drips, humidity, and wide temperature variations. 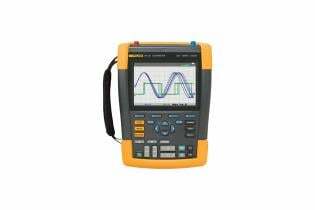 Fluke ScopeMeter test tools are hand-held battery operated, designed to meet the demands of field service professionals.